Manual tracking has been used since the 1970s as an effective radio telemetry approach for evaluating habitat use of fish in fluvial systems. Radio tags are often located by continually reducing the gain when approaching the tag along a watercourse to estimate its location, termed here as the ‘Gain Reduction Method’. However, to our knowledge the accuracy of this method has not been empirically evaluated and reported in the literature. Here, the longitudinal and lateral positional errors of radio tags are assessed when applying the Gain Reduction Method in a small stream environment. Longitudinal and lateral positional errors (i.e. the difference between the estimated and actual radio tag location) were evaluated based on the distance from the actual tag position, the gain recorded when estimating the tag position and a number of environmental parameters (i.e. stream depth, velocity, stream width and specific conductivity). The manual tracking trials produced an average lateral positional error of 0.91 m (± 1.4) and a longitudinal positional error of 0.66 m (± 0.87). A larger degree of longitudinal positional error was documented when the gain was higher (t = 2.21, p < 0.05). Larger lateral positional error was recorded when the tag was farther across the stream (t = 2.27, p < 0.01) and due to greater inaccuracy in longitudinal positioning (t = 3.2, p = 0.001). In addition, greater rates of lateral positional error were found when specific conductivity levels were higher (t = 2, p < 0.05). Longitudinal and lateral positional errors were not influenced by stream width (m), depth (m) or velocity (m/s). Although the Gain Reduction Method is commonly used to estimate habitat use of stream fishes, there appears to be a paucity of information in the literature that addresses the accuracy for obtaining fine-scale positioning of tagged fishes. This study is aimed to address this knowledge gap by identifying sources of locational error with the Gain Reduction Method. Overall, habitat variables were deemed to be unlikely to have a significant effect on estimating fish position in small streams. Researchers should be aware that error in the longitudinal direction will translate into larger errors in the lateral position. Further exploration of positional accuracy using this active tracking approach is recommended for larger and deeper fluvial systems. Manual tracking of fishes tagged with radio telemetry tags has been the driving force behind understanding their movements and habitat use for decades [1–3]. Precise measurements of fish locations are essential for accurate characterisation of macro- , meso- , and micro-scale habitat use and preference . Previous studies using triangulation in streams  have claimed accuracies from ≤ 0.5 m  to 6 m  or somewhere in between . However, triangulation requires several bearings and post hoc mapping to generate positions and requires specialised skills and training to locate a tagged fish with a high degree of certainty (i.e. accurate and precise). Triangulating the position of a tag is often used when fish have a high sensitivity to human presence or disturbance in small or clear streams, which makes it difficult to accurately portray their position without startling them. Alternatively, a tag can be located by following the strongest signal on foot, while continually reducing the amplitude of the radio signal (i.e. gain) upon approaching the fish, which is termed here as the ‘Gain Reduction Method’. Decreasing the gain provides a way of reducing both noise and radio signal volume, while increasing directionality . While radio telemetry has been used for the past 30 years to understand fish habitat use and associated movements [10, 11], there is limited information and analyses relating to the accuracy of this method for estimating the location of tagged fishes. When using the Gain Reduction Method, two positions in the stream, longitudinal (up- and downstream) and lateral (across the stream channel), are generally estimated. Although some studies do not collect the lateral position due to the large degree of error associated with locating fish across larger streams , this approach for manually tracking has been used to investigate fish behaviour such as movement relative to hydropower generation [12, 13] as well as with responses to catch-and-release angling . 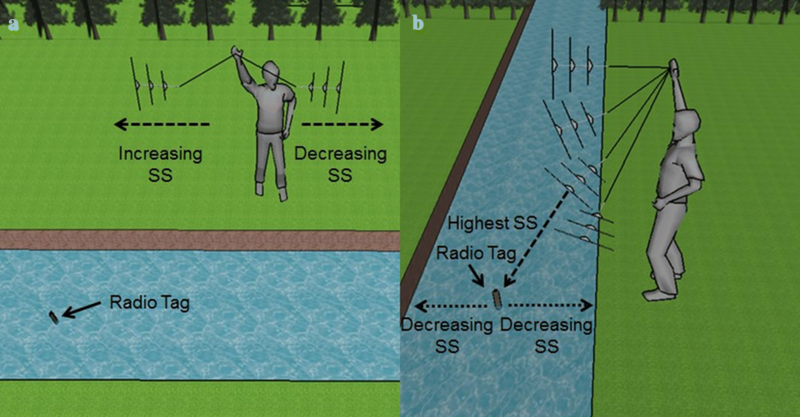 The purpose of this study was to demonstrate the degree of error associated with the Gain Reduction Method for locating a radio tag within a small stream system and evaluating which variables contribute to positional error. The accuracy of this method is evaluated by quantifying both lateral and longitudinal positional error when locating a radio telemetry tag in a small stream. Field testing was conducted on Forty Mile Creek (51°12′16.04″N, 115°34′0.93″W to 51°11′50.24″N, 115°33′43.34″W), which is a narrow (~ 8 m wetted width) montane stream in Banff National Park, AB, Canada, over the course of 12 days in July and August of 2016. Field tracking trials (n = 82) involved one field crew member who completed all tracking efforts to avoid inter-individual bias (hereafter, the ‘tracker’) and another crew member who was responsible for planting the tag within the stream (hereafter, the ‘planter’). The planter hid a radio tag (Sigma-Eight Inc., Markham, ON; 1.5 V, 84 dB, 150 MHz) in the stream by securing it to the streambed in a weighted grey-coloured mesh bag that could not be visually identified by the tracker. The planter hid the tag in one of the four possible lateral positions within a 1-km reach that was separated into 50-m longitudinal sections (i.e. 20 longitudinal sections). Lateral tag position was equally grouped into four categories during the field trials: (1) the bank closest to the tracker, (2) 1/3 across the stream, (3) 2/3 across the stream and (4) the bank farthest away from the tracker. These positions were used to ensure that a reasonable number of lateral positions across a narrow stream were adequately evaluated. However, modifications would need to be considered for larger-scale systems. The longitudinal and lateral tag locations were selected with a random number generator for each trial to avoid planter bias. At the beginning of each trial, the tracker would remain outside of the 1-km reach. Once the tag was positioned, the planter concealed themselves from the tracker in an area away from the stream and notified the tracker by radio that they could begin the tracking procedure. All tracking was conducted with a Lotek Wireless (Newmarket, ON) SRX 800 radio tracking receiver with a three-element yagi antenna (AF Antronics, Urbana, IL). The Gain Reduction Method required the tracker to sweep longitudinally (up- and downstream) with the antenna and then follow the direction of the strongest signal. The gain was kept at a relatively stable power so that it was not influenced by local interference. The tracker then followed the direction of increasing signal strength until the highest possible signal strength was attained (Fig. 1a). Once the highest possible signal strength was attained, the tracker reduced the gain to the lowest possible setting that the tag could be detected. This process repeated until the gain could no longer be reduced without losing the signal. The tracker was at the closest feasible distance to the tag in the longitudinal direction at this location. The estimated longitudinal position from the tag was recorded as the position on the bank where the strongest signal strength and the lowest possible gain was recorded. Once the longitudinal position was recorded, the tracker pointed the antenna directly at the stream surface while positioned perpendicular to the stream flow. By continually tilting the antenna vertically up and down towards the opposite stream bank, there was an audible difference in signal strength that was dependent on the angle of the antenna to the position of the tag situated in the stream (Fig. 1b). When the highest signal strength was identified across the stream width, the lateral position (i.e. 0, 1/3, 2/3, 1 across the stream) was recorded. For this validation study, the difference between the estimated and actual longitudinal positions of the tag (i.e. lengthwise along the stream) was measured to calculate longitudinal tracking error (m). Likewise, the lateral tracking error (m) was calculated by taking the difference between the estimated and actual position of the hidden tag. The time in minutes it took to locate a tag was calculated by taking the difference between when it was placed and located. The stream depth (m) and width (m) were measured at the exact position that the tag was planted. Specific conductivity (μS/cm) and water velocity (m/s) were sampled within the reach at the time of each tracking trial using a digital handheld multi-parameter water quality meter (YSI® Pro DSS). The ratio between water velocity and depth was calculated for each site to determine one of the three possible habitat types (i.e. pool, riffle, run; see ) at each recorded lateral position. Longitudinal and lateral positional errors were modelled separately with a set of habitat parameters (i.e. stream depth, specific conductivity, velocity, habitat type and stream width) as well as actual tag position and gain as model covariates. In addition, longitudinal error was included as a covariate when modelling lateral positional error. Multiple regressions were fit to the response variables using the ‘lm’ function in the R statistical software . After model fitting, the beta weights (βw) were calculated by standardising the model outcome and fixed terms to a variance of 1 using the ‘lm.beta’ function from the Quantpsyc package . This was done to evaluate the relative importance of the covariates for predicting each positional error metric. Prior to model formation, the covariates were evaluated for collinearity, outliers and nonlinear relationships. Model validation was completed by plotting residual error in the model against each covariate and fitted values of the model to assess normality and homogeneity of variance. The critical threshold for significance was evaluated at p < 0.05. The degrees of freedom for the effect and error are provided when presenting the t-statistic of the model terms. Mean and standard deviation are provided when presenting descriptive results of the data. From the manual tracking trials, the data demonstrated an average lateral positional error of 0.91 m (± 1.4) and a longitudinal positional error of 0.66 m (± 0.87) from the true position of the tag. All tags were located during tracking trials and on average took 21 min to determine a final position. Habitat type (i.e. pool, run and riffle) was positively collinear with water velocity and was not included in the multiple regression analyses. Gain was predictive of longitudinal positional error with a positive linear relationship (βw = 0.340, t1,73 = 2.21, p < 0.05; Fig. 2a). The greater the distance of the tracker to the true tag location, the larger the measurement error in the lateral direction (βw = 0.45, t1,73 = 3.00, p < 0.01; Fig. 2b). In addition, there was a larger rate of error in the lateral position when the longitudinal position was measured with low degree of accuracy (βw = 0.35, t = 3.2, p = 0.001; Fig. 2c). Specific conductivity (355.6 μS/cm ± 30.43; range = 296–381 μS/cm) was also found to negatively affect positional accuracy in the lateral direction (βw = 0.19, t1,73 = 2, p < 0.05; Fig. 2d) but not when estimating the longitudinal position of the tag (βw = 0.012, t1,73 = 0.12, p = 0.905). The modelling outcome revealed that water velocity (0.59 m/s ± 0.43; range = 0–1.53 m/s), stream width (8.13 m ± 1.47; range = 4.8–13.4 m) and depth (0.28 m ± 0.12; range = 0.8–0.58 m) did not have an effect on the positional accuracy in both measured directions (Table 1). The results of this field study provide some of the first insights into measuring the level of accuracy when conducting manual tracking of radio tags using the Gain Reduction Method. The objective of this study was to evaluate the rate of error when taking fine-scale positional measurements in a small stream. One of the key findings is that gain can be used as a proxy for distance from the tag in the longitudinal direction based on the fitted model. Trackers should be able to use gain to estimate the relative magnitude of error when determining a tag position along the length of a stream. For example, the relationship exhibited that a gain level of < 4 dB generated a longitudinal positional error of < 0.5 m. Conversely, a gain of 15–20 dB demonstrated a longitudinal error of 0.8–2 m.
The Gain Reduction Method may be useful for field personnel to approximate positional error from the true location of the tag by using the receiver’s gain. 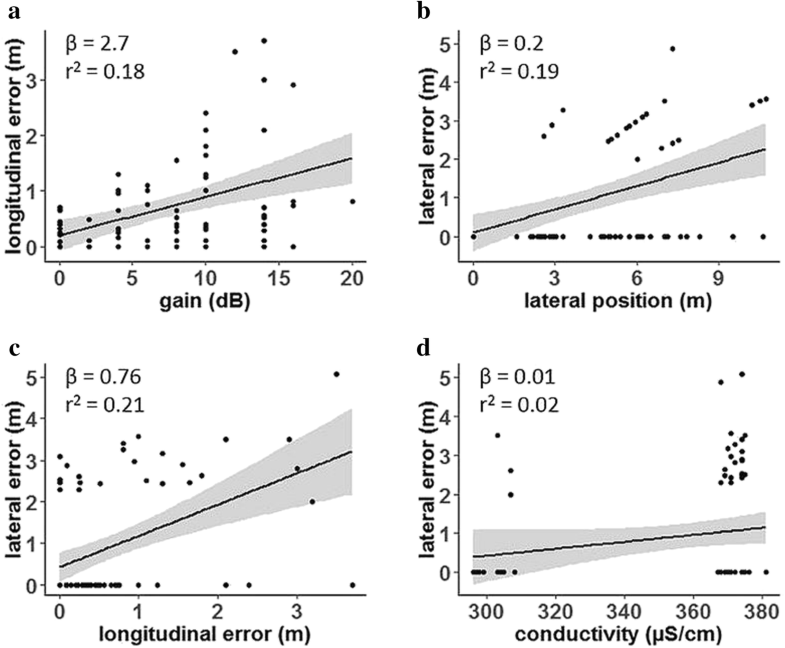 Given that the lowest gain units were associated with the lowest longitudinal and lateral tracking errors, final locations recorded for all fish should be taken at the lowest possible gain. Researchers may need to cross a stream, if possible do so without disturbing the fish, and track from the other side if they are particularly interested in achieving the greatest accuracy in the lateral position (i.e. tags that are closer to the farther stream bank when tracking). The specified error values reported here are explicit to the receiver equipment used for this study, but similar trends would be expected to be independent of make, model or manufacturer of the telemetry equipment as the physics of radio signals travelling through water and air would remain constant across studies. The findings reveal that several common stream habitat variables did not influence longitudinal or lateral positional error, which included stream depth, width and velocity. These variables may be important in stream systems that have a broader range of values. Further, changes in water chemistry would likely have an impact on signal strength and directionality; although they were not fully evaluated here. The field trials were conducted within a small reach on a single stream where changes in water chemistry were negligible across samples. Notably, conductivity was found to affect lateral positional error even across a small range in observed values (296–381 μS/cm), which corresponds with the findings documented to affect positional accuracy of radio tags by attenuating the radio signal as it passes through water [18–20]. Stream depth was not an important term for predicting longitudinal or lateral positional error, which could be due to the fact that the depth range was small (0.08–0.58 m). Stream depth has often been noted as a limiting factor for positional accuracy in radio telemetry studies , as the radio signal is exponentially attenuated with increasing depth [22, 23]. Although it was not quantitatively measured here, this study suggests that the Gain Reduction Method has similar accuracy as the triangulation method given that the errors were within the bounds of triangulation errors reported in the literature under similar field settings . Triangulation gives an estimated point location on the stream, but sometimes the error is large enough that a tag location may need to be recorded as a categorical position (i.e. left, centre or right). Although not quantitatively compared to triangulation in this study, the Gain Reduction Method may be considered an efficient approach to manual tracking as only two bearings are required to estimate a fish position, rather than several bearings that need to be mapped out after collecting the field data when using triangulation. However, the Gain Reduction Method is sometimes impractical when fish are readily startled from tracking efforts, which can alter natural behaviour or inflate tracking error. While this study was completed on a small stream (~ 8-m), the outcome may still apply to larger rivers [e.g. 12, 24, 25] but would require the use of a boat or vehicle to enable mobility of the research team, and water depth and stream width would likely influence positional accuracy. Overall, this study was able to test the accuracy of the manual tracking efforts using the Gain Reduction Method and demonstrated that gain, specific conductivity and lateral position of the tag can influence the rate of error in the measured position. Further research is warranted for this method with regard to lakes and larger river systems. In addition, an investigation across a larger range of water chemistry variables and stream channel morphology (e.g. streambed material, roughness and gradient) would be useful to build upon the results provided here. Furthermore, it would be prudent to evaluate positional error relative to seasonality since error rates were investigated over a short period (12 days in July and August) in this study. Environmental parameters often fluctuate according to the seasons (e.g. spring freshet versus base flow periods in late summer), which may lead to differing outcomes when measuring positional error. BGS, SHC, DPS, SJC and MKT contributed to the data analyses, interpretation of the results and writing of the manuscript. BGS and SHC performed the field trials. All authors read and approved the final manuscript. We would like to thank several Parks Canada employees including Kayla Eykelboom, Brenna Stanford, Colby Whelan, Kiva Waugh and Stephanie Holmes who devoted a number of hours towards this project, ultimately making this study possible. Cooke is supported by NSERC and the Canada Research Chairs Program. Not applicable—individual person’s data in any form were not included in the manuscript. All figures and table are the sole creation of the authors of this manuscript. Not applicable—human participants, human data or human tissue were not used in this study. There is no funding organisation for this study. R Core Team. R: a language and environment for statistical computing. R Foundation for Statistical Computing, Vienna, Austria. 2017. https://www.R-project.org/. Accessed 8 May 2017. Fletcher TD. QuantPsyc: quantitative psychology tools. R package version 1.5. 2012. https://CRAN.R-project.org/package=QuantPsyc. Accessed 14 Feb 2019.